All Indian Railways, PUs etc. Sub: Time-limit for submission of claims for Travelling Allowances – reg. Consequent upon the issuance of General Financial Rule (GFR)-2017, vide Rule 290 of GFR, time limit for submission of claim for Travelling Allowance (TA) has been changed from one year to 60 days succeeding the date of completion of the journey. Accordingly, in supersession of all earlier orders/instructions issued on the subject, it has been decided with the approval of competent authority that the claim of a Railway servant to Travelling Allowance / Daily Allowance on Tour /Transfer / Training / Journey on retirement, is forfeited or deemed to have been relinquished if the claim for it is not preferred within 60 days succeeding the date of completion of the journey. 2. In respect of claim for Travelling Allowance for journey performed separately by the officer & member of his family, the date should be reckoned separately for each journey and the claim shall be submitted within 60 days succeeding the date of completion of each individual journey. Similarly, TA claim in respect of transportation of personal effects and conveyance shall be submitted within 60 days succeeding the date On which these are actually delivered to the Railway servant at the new station. (i) In the case of officers who are their own Controlling Officer. The date of presentation of the claim at the Cash Section. (ii) In the case of officers who are not their own Controllilng Officer. The date of submission of the claim to the Head of Office/ Controlling Officer. 4. 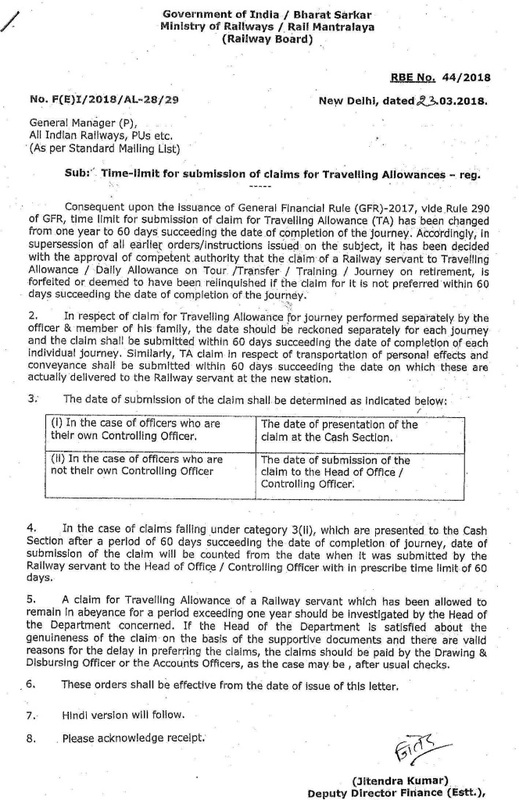 In the case of claims falling under category 3(ii) which are presented to the Cash Section after a period of 60 days succeeding the date of completion of journey, date of submission of the claim will be counted from the date when it was submitted by the Railway servant to the the Head of Office / Controlling Officer with in prescribe time limit of 60 days. 5. 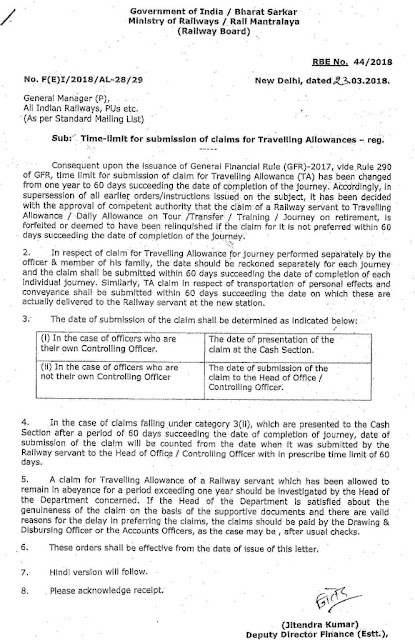 A claim for Travelling Allowance of a Railway servant which has been allowed to remain in abeyance for a period exceeding one year should be investigated by the Head of the Department concerned. If the Head of the Department is satisfied about the genuineness of the claim on the basis of the supportive documents and there are valid reasons for the delay in preferring the claims, the claims should be paid by the Drawing & Disbursing Officer or the Accounts Officers, as the case may be , after usual checks. 6. These orders shall be effective from the date of issue of this letter.